Visit the authors' companion site! http://www.electronicsystemlevel.com/ - Includes interactive forum with the authors! Electronic System Level (ESL) design has mainstreamed – it is now an established approach at most of the world’s leading system-on-chip (SoC) design companies and is being used increasingly in system design. From its genesis as an algorithm modeling methodology with ‘no links to implementation’, ESL is evolving into a set of complementary methodologies that enable embedded system design, verification and debug through to the hardware and software implementation of custom SoC, system-on-FPGA, system-on-board, and entire multi-board systems. 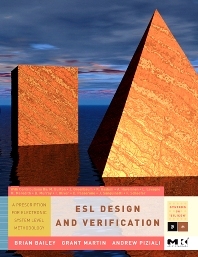 This book arises from experience the authors have gained from years of work as industry practitioners in the Electronic System Level design area; they have seen "SLD" or "ESL" go through many stages and false starts, and have observed that the shift in design methodologies to ESL is finally occurring. This is partly because of ESL technologies themselves are stabilizing on a useful set of languages being standardized (SystemC is the most notable), and use models are being identified that are beginning to get real adoption. ESL DESIGN & VERIFICATION offers a true prescriptive guide to ESL that reviews its past and outlines the best practices of today. PRIMARY: Industry practitioners; SOC engineers designing embedded systems… System architect, (MP)SoC system designer, Engineering managers in the (MP)SoC system design field.